10% non-refundable deposit on the balance that would confirm the group booking. We look forward to your arrival. 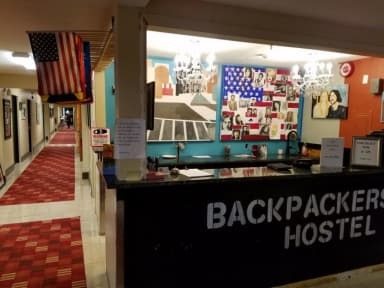 Please email us at backpackersboston@gmail.com your arrival time if you are coming in later than expected. Great facility, great staff! Wayne, Colleen and Tom were beyond friendly and helpful. They were great! so helpful!! so nice!! I had to check out but they let me keep car there until 2pm. Really they go the extra mile. they took the time to explain the subway to me. Tommy at the desk was so friendly and welcoming to this weary traveler. The Sox were playing the series and everyone was watching it in the pub. Someone made mac n cheese. It was like walking into Cheers. The rooms are bare bones but clean. If you need a safe place to crash this is it. There is some free parking. They also have shuttles to the train station. Wow. 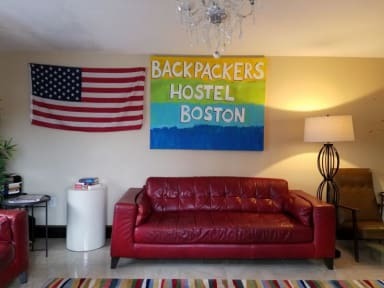 When it comes down to it, you have a few options: this hostel, HI Boston hostel, or an AirBnb/Hotel. If you want location, go to HI. If you want convenience, probably get an AirBnb. But if you want culture, if you want to experience what it's like to be in New England and live near Boston, then you HAVE to stay here. Why? Manager Wayne Matewsky. He is an absolute beauty of a human being and will make your stay worth while. Extremely nice, caring, and willing to give you an EXPERIENCE. STAY HERE. Located out of Boston city. Great if you're driving. They have a free shuttle service which is awesome. The facilities were generally clean, people and staff were friendly. Only complaint is that the showers were too small. Staff where reałly friendly and helpful. Free shuttle bus to the train station was great. Nice friendly welcoming vibe. Loads of showers and toilets. Beds where really uncomfortable and there didn’t seem to be staff during the night/early am to quite down other drunk patrons running around being loud and disruptive. This hostel is very very very expensive, for an uncomfortable bed, scratchy sheets and a bad breakfast. The staff were very friendly that was the only good thing. Do not stay!!!! I thought the price was much too high considering there were no lockers available during my stay, the location is pretty far from downtown Boston (although they do provide a shuttle service to the closest train station), the front door didn't seem to lock at all the whole time I was there and the whole place needed refurbishing. A couple of the staff members I spoke to were incredibly friendly and helpful, but one of them was honestly one of the rudest people I've ever encountered.